After days of sun and unseasonably mild (and dry) weather, clouds blanket San Diego this morning. Overcast skies are excellent photography weather, and I just had to take a cat walk (accompanied by my beautiful wife). 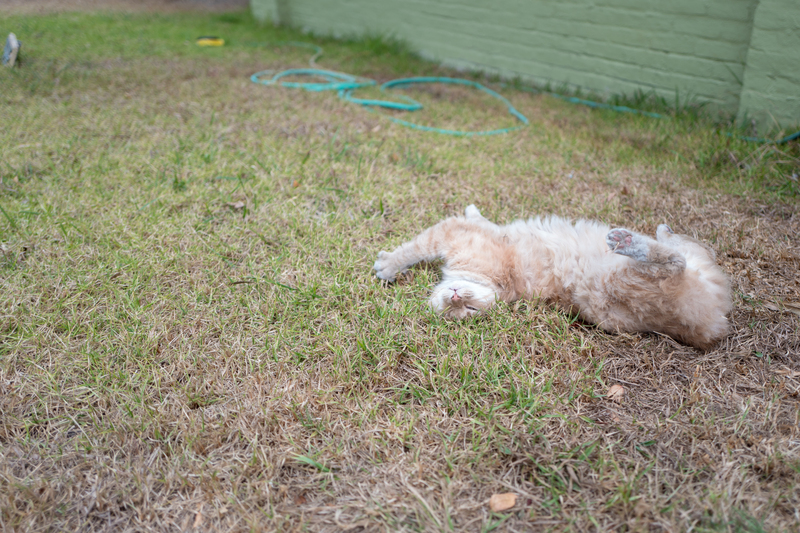 Along Georgia Street, between Adams and Madison, Anne spotted a fluffly ginger-light—tan, if you ask me—rolling around a lawn. Just then, the owner parked his vehicle, and by the looks of dress and carry-alls, he had returned from the gym. He told us about Reddy—a one-eyed, 10 year-old male without a tail. The family found him as a kitten, with apparent injury that later required his tail to be amputated. Reddy lost his eye years later, when wearing a collar. Something caught on a fence—and, well, let’s spare the gruesome details. But suffice to say he notched the second of two lives, and, you know, he can’t afford to lose any more body parts. What to a human might mean handicap is little consequence to Reddy, who, even in elder years, is lively and active. 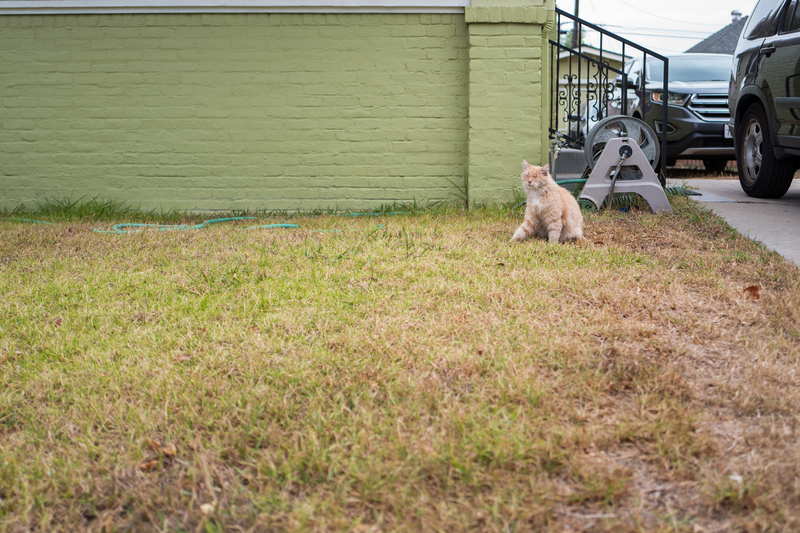 Like many cats on the East side of Park Blvd.—and sufficient distance from coyote canyons—Reddy is an indoor-outdoor roamer, who shares residence with a bountifully-furred calico. We saw her looking out the porch window (smoked glass prevented my capturing a portrait). I carried along Leica Q and iPhone X, but the real camera’s photos were a wee bit over-exposed. The aperture was too wide for the preset shutter speed. But I shoot RAW, and Adobe Lightroom Classic CC auto-adjusted nicely, followed by my contrast tweaks. The X did a tremendous job accurately capturing color and contrast, but with a bit of punctuated vibrancy. I used the smartphone’s second lens to 2X zoom for the Featured Image. Vitals: f/2.4, ISO 20, 1/60 sec, .97 ev, 6mm; 9:07 a.m. PST. This photo does Reddy diservice. He spent most of his time rolling around the grass, presenting few good poses for portrait. 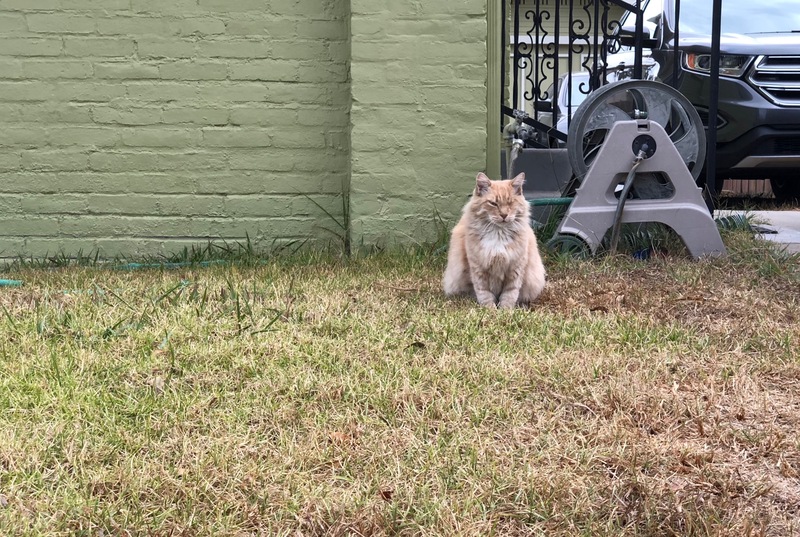 He looks frumpy and grumpy, and the furball is neither. I chose this one, so that you could see his face (and where an eye is missing). The other two are crops captured with Leica Q. In the second of these, you can see that Reddy has no tail. Vitals are same for both: f/1.7, ISO 100, 1/250 sec, 28mm; but 9:09 and 9:10 a.m, respectively. From the archives: Scruffy, Roly Poly, Woo, Skull, Biscuit, The Colonel, White, Chipper, Frisky, Stretch, Needy, Farfisa, Mates, Hunter, Pee-Pee, Blue, Blue Too, Bonded Pair, Patience, Fess, Jumper, Frenemy, Looker, Cozy, Scout, Lurks, Skit, Mini, Betty, Black and White, Stalker, Bell, Chill, Sammy, Scratch, Poser, Star, Grey and White, Watcher, Herman, Comet, Roman, Willow, Chub, Nimbus, Watson, Lilo, Kit, Pepe, Twilight, Sebastian, Spot, Booger, Ash, Veruca, Riley, Mellow, Bonde, Flower, Glass, Black, BeBe, Fang, Bruce, Siamese, Pounce, Tortie, Haiku, Fraidy, Peso, Daniel Tiger, Dusk, Stride, Dainty, Spry, Tabby, Betty Too, Still, Levi, Shadow, Sophie, Wink, Ferals, Momma, Charlie, Tux, Cool, Benny, Jellicle, Itchy Valentino, Goldie, Nine, Amanda, Siesta, ChaCho, Charlie, Too, Mika, Crystal, Seeker, Mittens, Dancer, Smokey, Monkey, Captain Blackbeard, Season, Maven, Tink, Chunk, Curious, Hanoi, Bella, Tarry, Guido, Maxine, Mr. Kitty, Peohe, Panda, Frankie, Sunshine, Twain, Willow, Too, and Brawn.